Since my heartfelt words only seem to offend, I've thought it best to let Shirky do the talking. Consequently, the selections that follow have been taken directly from Here Comes Everybody (2008). Any emphasis, [additions], or hyperlinking have been added by me. Here's to the learning revolution that I think can occur when people step up to make impossible things happen. Simply "showing up" will never be enough. I posed as you, for a brief moment, while commenting on Sue Waters' recent post. I did so to demonstrate how easy it can be to forge one's identity and to illustrate how trusting we can be in our online interactions. Trust online is an interesting thing because we’ve all become accustomed to believing our eyes and trusting that people are honest in how they present themselves. That said, how do we really know who is actually commenting on our blogs, who is honestly writing the posts that we read, and who is truly the person behind those curious posts to Twitter? A perfect example of this lies (no pun intended) in the US presidential race. Obama and Clinton both maintain active Twitter accounts. Do you honestly think that Barack himself is anxiously posting to Twitter? Yeah, right. Nevertheless, it looks like Obama. We think that it’s Hillary. Or at least we want to think that it is. When all is said and done, we’ve been nothing but duped. Duped into thinking that we’re dealing with a person that we thought that we knew. We trusted them. We wanted to believe. …in the end, it was none other than Drape. And THAT is full disclosure. While I realize that in falsifying my identity I've broken several rules of etiquette, I hope you can sympathize with my intent - which was never to harm, but always to teach. P.P.S. Thanks again for sharing gRSShopper. I've added a word to one of last week's posts. The word was "nearly". The reason I added the word is because I don't think that David Jakes (or myself) had considered two very important levels of Twitter, deep-rooted in its use. People become obsessed with Twitter because there appears to be a difficult-to-explain emotional connection that Twitter users feel toward the people they follow. This connection is only amplified if the following is mutual. Furthermore, this connection seems to be more powerful than was ever obtainable through blogging alone, adding a far more personal, human aspect to online interaction than ever before. Possibly, the nearly-synchronous nature of Twitter helps to forge this emotional connection. Twitter's 140-character limit may also contribute to the development of emotional connection. It's a game, you know, that Twitter users are all forced to play. In playing this game (called: "Say It Clever/Complete/Well in 140 Characters") we all grow closer together. The network that plays together stays together. 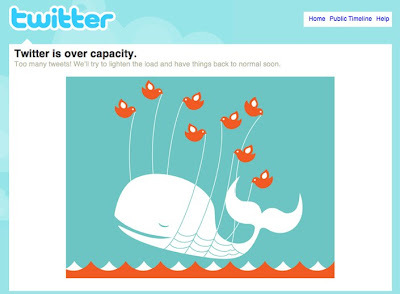 Twitter's habitual break-downs may actually help its popularity. I know I feel closer to people with whom I've experienced mutual hardship. Because my posts to Twitter are publicly viewable, a simple scan (for the word 'wikispaces', for example) will potentially yield a view of something I have said. Consequently, Twitter user jbyers gets a brief (140-character) view of my angst and offers his reply. 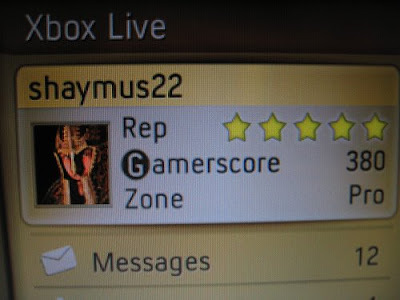 James Byers, by the way, is the founder of wikispaces. Now, I doubt that this commercial level of Twitter was ever foreseen by Twitter's creators. Nonetheless, it should be considered as a possible way for Twitter to gain the revenue needed to sustain growth. Not only is Twitter Customer Service™ free and open, but in successful use it creates an emotional bond between the customer and the company (see above topic). Do you think I'll use wikispaces more now, given that I've actually "spoken" with (who I thought was) the company's founder? You bet your wiki-twitter-spaces I will. What happens to Twitter when someone that's actually popular begins to use it? When David Jakes spoke up about how he “would like to see some other voices step-up and lead”, I took it as a gentle encouragement for others to actually step up and lead. As a result, I volunteered to facilitate a discussion about blogging and Twitter etiquette at NECC Unplugged. In doing so, I had also hoped that others would follow suit, eagerly adding their names to the list of Short Talks, Speed Demos, and Facilitated Discussions. Sadly, at this point in time, only a handful of people have followed suit. It’s pathetic, really - to phrase it honestly. As I think about the throngs of Twitter enthusiasts that continue sign up for Monday night’s Twitter dinner, I can’t help but feel sickened by “our” overall hesitancy to teach - particularly in light of Twitter with all of its “educational value”. Are we not teachers? Do we not educate for a living? 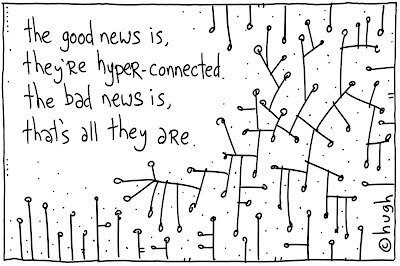 Or has Twitter, and blogging, and everything else 2.0 changed how we feel and what we do best? At its best, Twitter is a place to share a resource, a link to a new blog post, or an insight, and even a place to have a little fun. It’s a place that could be about learning. At its very worst, Twitter is a self-indulgent exercise in self-promotion and pettiness. Combine this thought with our apparent infatuation with Clay Shirky and his Here Comes Everybody and now I’m about to blow a gasket. Is it just me or doesn’t everybody find it oddly ironic that the comments on the “Here Comes Everybody” blog have been “broken” for nearly a month? Here comes everybody? I guess not. I can't tell you how refreshing it is to see people that actually get it. Here are two that do. Some people get it. Some people do not get it. Do not dilute your message for these people. Give them all the inferno. The embers that reach those on the outskirts will eventually turn into flames. It is time to toss out the “blog, wiki, podcast” mantra. This is bigger than tools isolated for singular purpose. If we keep pushing the tools into categories, new users will continue to only use the tools for those purposes. We should be twisting, stretching and breaking these tools, not neatly packaging content with them. A wiki is no place to start an intentional, sustainable community. I’ve always said this to my internal customers, but it has been based on my use of them. I’ve now heard many many people describe how the wiki did not work for creating a sustainable network. Let’s let it go, move on and get more creative with our wiki use. Networked learners are more confident than individual learners in questioning authority, discovering alternative realities and resolving critical concerns through thoughtful inquiry. Technology enables people to assign meaning to symbols and words. 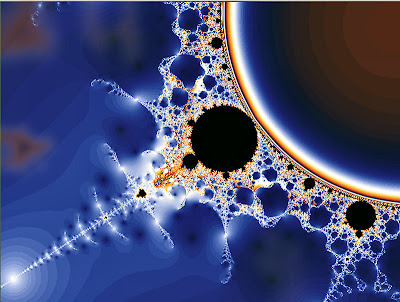 Meaning is multi-dimensional. It IS about the technology, and it IS about the people. 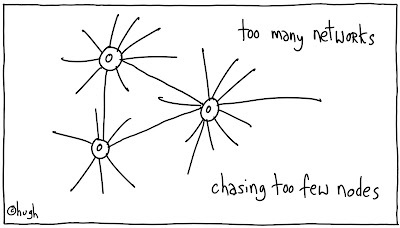 Jen's advice to not "dilute the message" of the potential of networked learning should be SHOUTED from the rooftops. Second, Hugh MacLeod speaks of an important issue we all face right now when considering networked learning. My gut feeling is that EVERY node should have something of tremendous value to offer the entire network. Tapping into that something may be the real trick. 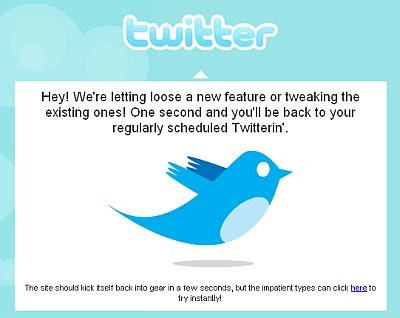 Twitter goes down sometimes. Sometimes can also mean "a lot". Have you ever waited to push that magic Publish Post button until a time when you knew that Twitter was up and active - just so Twitterfeed would effectively market your post to those in your Twitter network? I hate these videos. They're funny, entertaining, and ring loudly with truth - but only because every one of us knows the type. In fact, I doubt I've ever seen the mindset of mediocrity so beautifully portrayed. Except maybe here. Nevertheless, does this commentary about our teachers do one ounce of good in improving our plight? As the 31-Day Commenting Challenge continues in full swing (over 120 participants at this point in time), I wonder if there aren't additional thoughts regarding commenting etiquette that have yet to be discussed. 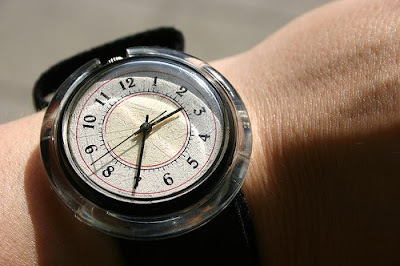 Timeliness as it relates to comments, for example, may be an issue deserving attention. To illustrate, I recently responded to a blog post and conversation that had taken place fifty days prior to the date I wrote my response. I prefaced my post by admitting that the post "may be late to the game." Miguel Guhlin expressed similar concern over his "tardiness" when he posted a comment related to the same aged conversation, just ten hours after I had posted about it. Whether his apology for tardiness related to my post or to the fifty-day-old conversation is irrelevant. Conversely, there are times when people continue to comment on posts that have been tucked away in the archives for quite some time. For example, Anne Mirtschin wrote an excellent post detailing a number of things she has done in her classrooms this year in relation to cybersafety. Even though the post was written on March 27, it continues to receive comments from readers nearly six weeks later. Similarly, a post I wrote on April 15 entitled Becoming A Better Teacher, has been sporadically commented upon since then (with the latest influx of comments coming in just a few days ago). Interestingly enough, these late comments have possibly added the most meaning to the conversation, as many of them were written by students instead of teachers. What are the time limits for conversation? Must I apologize for arriving late to a conversation - even if the conversation takes place on a medium as asynchronous as blogging? 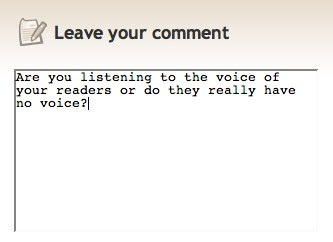 As a blogger, should I feel guilty if I don't respond to comments made to posts that have long since found a home in the archives? Should this idea be included in our Edublogger Etiquette discussion? If so, I would prefer to use your examples rather than mine. Which posts have you written (and long since archived) that still receive comments? Image Source: Flickr user ani! 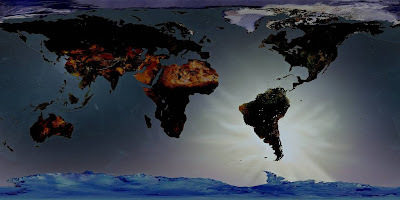 Flickr user Aldo has created an equirectangular projection of the surface of the Earth, effectively demonstrating that differing points of view bring different facets of perspective. Of course we're used to look[ing] at the earth from the outside in, not the other way around. I made this image a couple of years ago as a better view of the earth surface, from the inside out. The water of the oceans is transparant, so you get to look in to space. This differing point of view expresses an idea of Earth's landscape not frequently anticipated by many observers. Likewise, because blogs can be accessed by people from all around the world, a number of cultures, languages, and perspectives are potentially inherent in nearly any publicly-accessible blogging conversation. Cheryl Oakes has written a post describing several Signs of Spring in Education (2008) that she has noted. To begin her post, she calls attention to the fact that seasons, times, and dates are dependent upon geographic location. 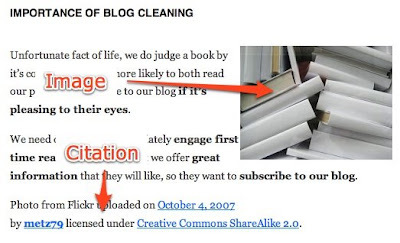 Gary Stager has called edubloggers to task (2008) because they haven't written more about the fact that Reading First has "failed to improve the reading comprehension of American students." While he doesn't openly address his post to Americans specifically, a quarter of the people that have commented on his post (3/12) are not American edubloggers. Jane Nicholls has proclaimed (2007) that "the most empowering factor of [podcasting] has to be the global audience." She continues with an important question (originally asked by Tim Tyson) that should be asked of every blogger, regardless of geography. "What do you have to say that the world needs to hear?" Graham Wegner elaborated in his Olympics Effect Theory (2007), "Unless you live in a smaller country, you can’t see that many of the issues pushed as being important around the edublogosphere are actually focussed towards the biggest participating nation and its education system." Julie Lindsay, in a comment here (2008), has described a few egocentric behaviors as she has observed them. Gabriella Grosseck writes from Romania. Some of her posts, nevertheless, include pieces in languages other than Romanian. 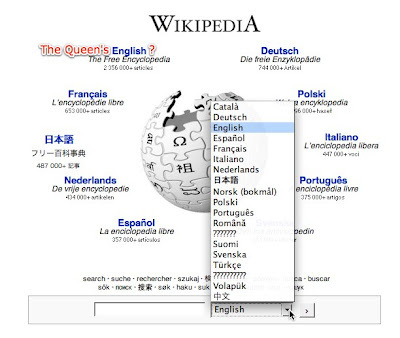 This post (2008), for example, contains sections of Spanish, English, and Romanian. Silvia Tolisano has written an extensive post (2007) listing a number of recommendations for "being a globally friendly blogger." Included in her list are suggestions to take local measurements into consideration, be aware of national holidays, and stay away from global stereotypes. 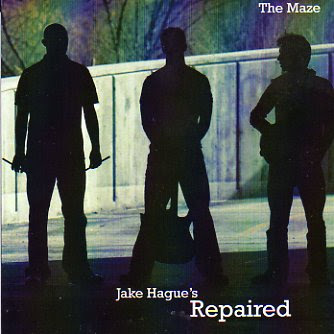 For your listening pleasure, I thought I'd share a song or two from a CD recently released by a band called Jake Hague’s Repaired. The CD itself is a glaring example of what technology has done to empower the little guy, for there were no contracts involved, no recording labels, and no red tape involved in its production - nothing more complicated than three guys getting together and jammin’ in the backyard. To top it all off, I’m very proud to say that the drummer is none other than my no-longer-little little brother, Josh. Thanks for the tunes, Josh, I think they're great! Both songs are © 2008 Jake Hague and distributed with permission. 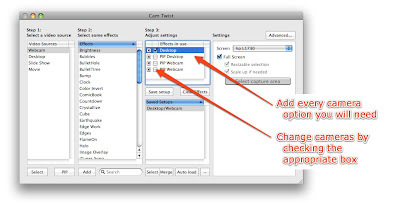 I've been asked a number of times to share additional tips and tricks regarding the Ustream/CamTwist 1-2 punch we used to enable the kind of learning environment created for OpenPD (please see my post here for initial thoughts and tips regarding the practice). Tip of the Day: Work Within the Limitations of CamTwist. Here's how to do it, assuming here that you've used CamTwist before and understand the difference between a 'Selected' source and a 'PIP' source. It's most important to understand that you've got to add every camera option you will need (all four, in our case) to CamTwist's list of possible sources/effects (Step 3). Once they're added to the list, you can then switch cameras - effectively turning them on and off - by simply checking the appropriate box. Click on each of the screenshots below to get a better view. In adding the various camera options, you will need to select the right kind of settings for each source. For the presentation itself (that is actually being shown on the projector, or second screen), you'll want to choose 'Desktop' > Select. 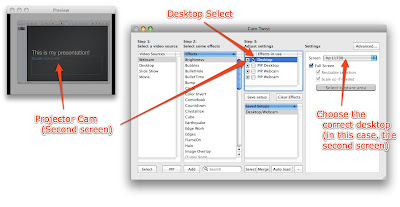 Then choose the second screen (from the pull-down menu) as the desktop to be shown. The rest of the camera options are actually PIPs scaled up to fill the entire screen. No good? I hope this makes sense but realize that I've probably only confused you more. Drop your questions into the comments and I'll take a crack at 'em. Al Upton has been blogging for years with his students. Upon attempting to take his student blogging to the next level, he invited the educational blogging community to mentor his students. The idea was for the adult mentor to occasionally visit the student blogs, leaving a positive comment. It seems that this blog in particular is being investigated regarding risk and management issues. What procedures should be taken for the use/non-use of blogs to enhance student learning will be considered. There will be no photos or names of students - no identifying information at all. 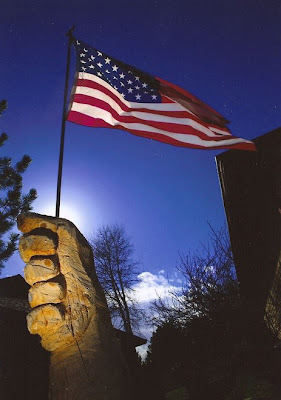 Until further notice, only Al will add posts or pages to this blog. Subscribers may add comments. These will all be moderated by Al. As administrator I [Al] reserve the right to not approve comments - there will be no justification. minilLegend students may only refer to themselves by ‘mini’ followed by a number eg mini17, mini24. Right now, I think we are watching Twitter change right before our digital eyes. Be the first with the tool (Diigo, for example), be the first with a post, be the first with the wiki, be the first to uStream, stake your claim in a never-ending game of name building and recognition. Take advantage of the commons, go ahead. While the post itself is chiefly about Twitter and what Jakes considers to be "over the top self promotion," the comments to the post have sparked an interesting discussion about personal growth, extending oneself beyond the echochamber, getting involved as an educator, and becoming a catalyst for change. Do you think that the idea of "offensive self promotion" takes care of itself in the very act of "following?" Do we simply "un-follow" those who's level of self promotion bothers us or whose intent we question? In the Interesting Side-note Department: Partly because of Jakes' push (and mostly because I have always thought this would be an important discussion), I have decided to take this topic to NECC in the form of a facilitated discussion at the first-ever Fringe Festival (Concurrent Session 10). If you would be interested in participating with me, I would love to have you join me. 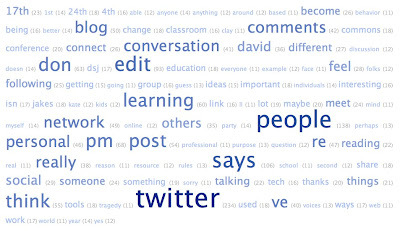 Image Source: This image is a tag cloud that I created from the text of the 93 comments to Jakes' post. To begin with, I'm pleased with the interaction that has taken place and the ideas expressed in the comments and elsewhere with respect to the series of etiquette posts that I recently published. I am very much appreciative of any contribution to the discussion. Nevertheless, in watching the conversations unfold, I've become increasingly aware that an attempt to identify the norm in such a matter is particularly difficult, given that most online behaviors are subject to personal interpretation and that the blogosphere has been formed on the foundation of (often-chaotic) personal expression. That said, as one that teaches teachers how and why to blog, a list of such etiquette do's and don'ts would sure be helpful. Surprisingly, the number one issue that anyone appears to have taken with respect to this series has nothing to do with the questions I’ve asked or the examples I’ve cited. Rather, some seem to feel that educational bloggers are fundamentally bound by the same rules of etiquette that have been unofficially set forth by the global blogging community in general. Honestly, it is that very mindset of mediocrity (the mindset that educators are free to slack because others slack) that has contributed so forcefully to the detriment of public education during recent decades past. Would our profession not be better respected – both in attitude and in finance – if we teachers hadn’t lost the confidence and trust of our patrons somewhere along the way? To think that educators shouldn’t be governed by a much higher standard, in my opinion, is to do the entire system a tremendous disservice. When a teacher fails to, for example, adequately cite sources in a blog post, is a message not sent to all students watching that such behavior is acceptable? Will not such attitudes, as they have been so effectively taught through example, then be promulgated by an entire generation of learners? Ours is the responsibility, as teachers in this global classroom, to set an example so clear that any possibility of misinterpretation of what is (and what is not) acceptable behavior diminishes entirely. Thus, the etiquette followed by edubloggers can be, should be, and must be inherently different. It seems to me that when Graham Wegner questioned the wikipedic wisdom in relation to proper spelling, he really didn’t question Wikipedia, the crowd, or even the way that some words should be spelled. Rather, he questioned the entire system itself and his lack of representation in such a system. Few can argue with how effectively the Internet has managed to thrust English – as a language – into the faces of peoples and cultures throughout the world, operatively requiring the planet to learn or be lost. For if one fails to learn English, one likely fails to compete in our now global market. Nevertheless, and to the despondency of Graham and millions of others culturally similar to him, the dialect that has been thrust upon the world is not that of the Queen, but rather that of the American. 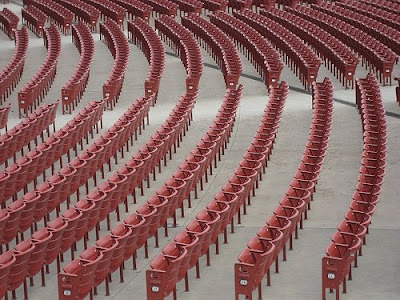 When the wisdom of the crowd is determined by the crowd, then those in the minority simply lose out. For in the end, the higher percentage of Americans that constitute the English-speaking Wikipedia community, have determined that color will rarely be colour – plausibly demonstrating that at times even spelling can be a matter of popular opinion. John Connell included a Creative Commons licensed photo in one of his posts. To attribute the author of the photo, he linked to the photo's page in Flickr. He failed to actually mention the name of the photo's author in his post. She got mad, he said sorry, and ultimately removed the photo from his post. First, I think we can all agree that sources should be cited. John Connell demonstrated one extreme of the image attribution can of worms. Here are two other examples that illustrate the other extreme. 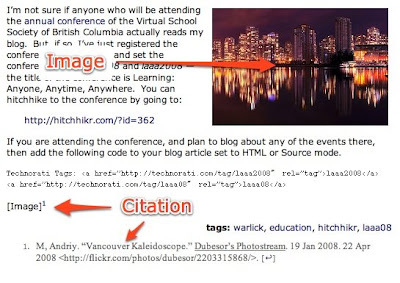 David Warlick cites all of the sources he uses for his blog posts (images and other content) using formal MLA protocol. While I don't know this for sure, I'm pretty sure he uses the Son of Citation Machine to formulate his citations - after all, he created it! Sue Waters has also gone the extra mile when citing her sources. When she includes Creative Commons licensed photos in her posts, she not only lists the name of the author but also includes the date the photo was uploaded and the license the photo possesses. 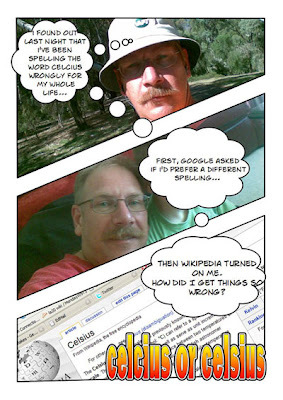 Sue uses John Johnston's newly created Simple CC Flickr Search to create her citations. M, Andriy. “Vancouver Kaleidoscope.” Dubesor’s Photostream. 19 Jan 2008. 22 Apr 2008 . 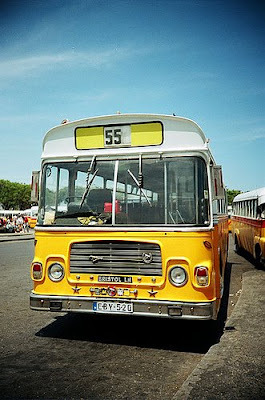 Photo from Flickr uploaded on October 4, 2007 by metz79 licensed under Creative Commons ShareAlike 2.0. Deep linking, on the World Wide Web, is making a hyperlink that points to a specific page or image on another website, instead of that website's main or home page. Such links are called deep links. Some commercial websites object to other sites making deep links into their content either because it bypasses advertising on their main pages, passes off their content as that of the linker or, like The Wall Street Journal, they charge users for permanently-valid links. Sometimes, deep linking has led to legal action such as in the 1997 case of Ticketmaster versus Microsoft, where Microsoft deep-linked to Ticketmaster's site from its Sidewalk service. That said, I wonder if deep linking might be - at times - acceptable. In following Leo Laporte's example, I have chosen to include a listing of my user profiles as I have created them on other services. I do this to not only help people find content I am sharing using other online services but to also indirectly advertise that such sites can be used to share content. The only real issue here is that the icons I've used to identified such services are actually hosted on the websites themselves (they are favicons). Is such a practice inappropriate? Should I host the favicons on my own site and link to them there? Is this more of an issue for Leo Laporte (with his blog's millions of monthly visitors) than it is for me (with my blog's three or four uniques)? In a recent post on Students 2.0, Arthus Erea has embedded a YouTube video. The contents of the video include a 1971 interview of Muhammad Ali conducted by the BBC. 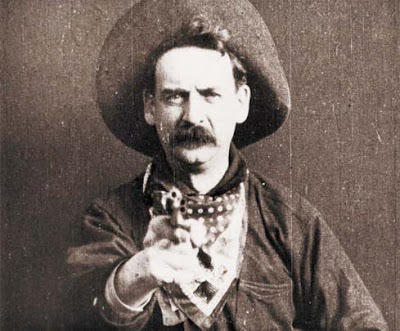 While it can be argued that content wouldn't be on YouTube if it weren't meant to be shared, the movie Arthus and I have posted is clearly an infringement of copyright. Or is it? Does it matter if the original video (the BBC interview, for example) doesn't specify copyright restrictions? Here's a hint, if you're interested in my opinion. HUGE can of worms here, I know. Hall, lay down the law for us, would you please? Will Richardson is an extremely popular edublogger. Will has, at times, failed to publicly respond to comments made on his blog. For example, the last time Will has written a public comment on his own blog was April 25. Since then, he has written six posts (which have accumulated 77 comments and trackbacks), none of which addresses any topic that may have arisen in the comments of or trackbacks to his posts. While every blogger likely lapses - from time to time - into a nonproductive "blogging funk", is it possible that in ignoring the comments of one's readers, a message of elitism may be exuded (particularly to that timid teacher that may have just posted the first comment in his/her entire life)? While not public, some bloggers choose to respond to blog comments through private email conversations (including Will - likely this is how he has chosen to respond to comments made on his blog during the last week). If a response to a comment will result in a particularly lengthy retort, it is often the practice to reply by writing an entirely new post. With emerging forms of communication and conversation, additional forms of feedback (like Twitter) are also used to reply to both blog posts and comments. In a recent comment, I told a blogger, "It's your blog, you make the rules as to how you respond to your readers' comments." Was I actually telling the truth? Graham Wegner wrote a tongue-in-cheek post about spelling. Hailing from Australia, Graham finds it funny that "the Wikipedic wisdom of crowds defines the right spelling" for him. Matthew K. Tabor wrote a post in response to Graham, claiming that "spelling isn't a matter of opinion". In his response, Matthew not only critiques the ideas of Graham but also those of the people that made comments to Graham's post. A somewhat tense discussion ensues in the comments of Matthew's post, on the blogs of some of the comment writers, and also in the Twittersphere. What are the rules inherent to such discussions? Few bloggers actually anticipate - in writing - the response of their readers. Apparently, Stephen has manufactured an online reputation that has caused David to assume that Stephen will immediately react to David's post. In considering online interaction, it is important for all bloggers to realize that what they publish - either in a blog post, in a comment, or in any other form of online behavior - contributes to how others perceive their words, actions, and persona.